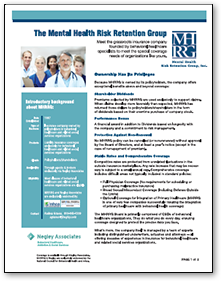 The Mental Health Risk Retention Group (MHRRG) specializes in providing liability insurance for the behavioral healthcare field. They are endorsed by the National Council for Behavioral Health and the Mental Health Corporations of America, two associations representing community mental health centers nationally. The Mental Health Risk Retention Group, a liability insurance company owned by its policyholders, offers stabilized premiums, protection against arbitrary cancellation, quality coverage, and a loss prevention program. Available coverages include professional liability, general liability, directors and officers liability.